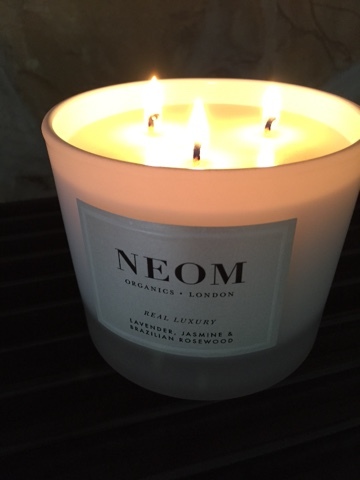 I was given a scented candle from Neom a good few months ago now. It was part of a relaxation program I was asked to test and I have been using the candle ever since. I thought a pros and cons post, I can't quite work out yet if I'd buy one of these candles myself so I will set out the pros and cons then you will just have to work it out for yourselves! This is a luxury item, everything about it is luxury and nothing more than the packaging. It comes in a fantastic box, strong and well made, we have been using it since to store craft stuff! The fragrance of the candle is really strong. I mean really strong. We have a virtually open plan ground floor and this one candle gives a scent throughout. It is made with high quality Essential oils thus a fantastic natural scent in a market that's often saturated by artificial fragrances which I cannot stand. 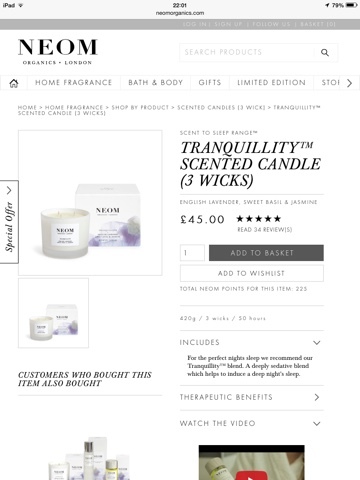 Used together with the other Neom products and your personal relaxation techniques, this candle can be used as part of a holistic approach to stress relief. This candle is huge, slow burning and it Lasts forever! Is it worth it? This candle costs £45. On the flip side it does last forever. If you are looking for a real luxury gift or treat for yourself no expense spared this could well be for you! Investigating a little, I found this brand available in my local Tkmaxx with some rather good discounts. The wicks really hard to light. I know this sounds stupid but it's virtually impossible. Aside the costs this is really the only con. What do you think then......you decide!